Environmental as well as economic reasons call for a sustainable alternative for the use of fossil fuels. Light energy harnessed by photosynthetic organisms provides an attractive mean for biofuel production. Biofuels derived from sugars and oils found in arable crops have already been commercialized; however, these processes are not cost-effective. Additionally, the impact of these ‘first generation biofuels’ on food supply and price have raised ethical questions and encouraged a search for an alternative biomass source. Cyanobacteria offer an efficient mean for biofuel production that is not associated with the current problems of land-based-biofuel feedstock. They combine the benefits of fast growing simple microorganisms with a cost effective mode of growth based on light energy and mineral nutrients. We aim at establishing a simple process for bioethanol by yeast fermentation. We modify cyanobacteria to increase glycogen level as raw material for bioethanol. (Manuscript in preparation). 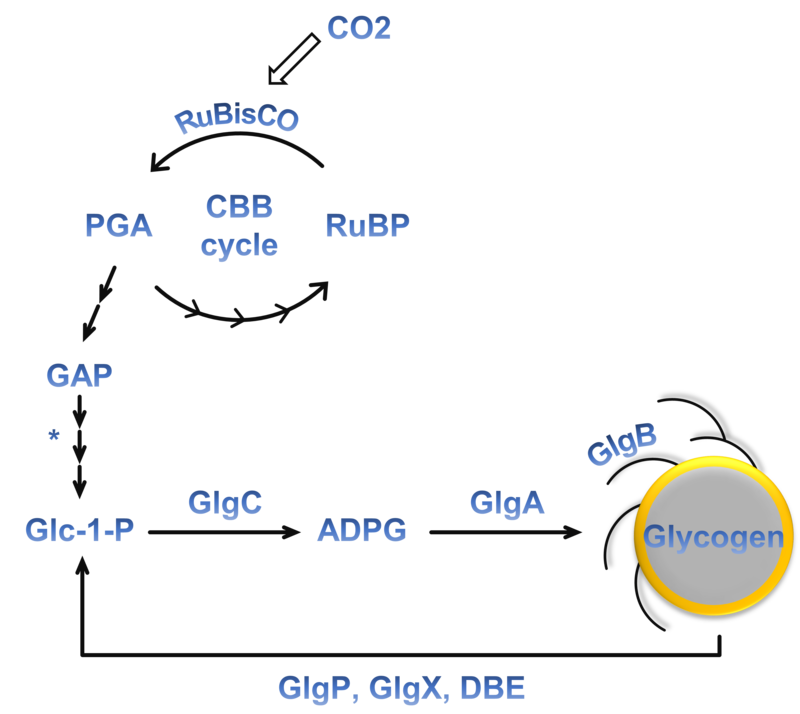 Schematic presentation of glycogen metabolism.